What Is the Microsoft Office Upload Center, and Should You Disable It? The Office Upload Center is part of Microsoft Office. Install Office on your computer, and this tool will appear in your system tray. Sure, you can hide this icon, but should you? What exactly does it do, anyway? 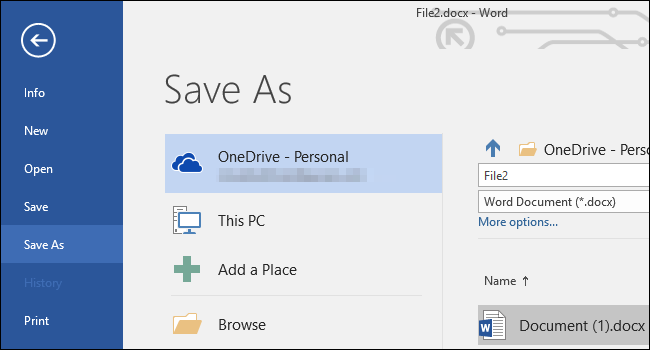 When you save a Microsoft Office file to an online location–for example, when you save a file to Microsoft OneDrive or a SharePoint server–Office doesn’t just save the file directly to that server. Instead, it saves the file to the “Office Document Cache” on your computer. Office then uploads that cached file to the server and handles any connection or file conflict problems. For example, if you’re working with a spotty Internet connection, you can save a file to the remote server and Office will upload that file later on, when you have a solid Internet connection. If there’s a problem uploading a file, Office can keep that local copy and inform you of the problem. If the remote server itself has a problem, Office can hold onto its local copy and upload the file when the server comes back online. The Office Upload Center gives you a way to view these upload tasks and interact with them, which is especially helpful if there’s a problem. If there’s a problem, you’ll get a notification and you can deal with it. You can view pending uploads, view completed uploads, and view all cached files. This tool does feel a bit redundant if you’re using Microsoft OneDrive, as Windows 10 and 8.1 both include built-in support for OneDrive. But it’s used for more than just OneDrive. The Office Upload Center will be on your PC if you’ve installed Microsoft Office. You’ll often see it in your system tray–its normal icon is an orange circle with an up arrow on it. The icon changes when there’s an error or other problem, giving you immediate feedback. Click it to open the Office Upload Center. You can also open your Start menu, type “Office Upload Center,” into the search box, and click the Office Upload Center shortcut that appears. The “Upload All” and “Pause Upload” buttons allow you to begin or pause uploads, but you shouldn’t normally need to use these functions–it happens automatically. The “Actions” button allows you to perform actions on the current file, such as opening the local copy, opening the remote file server’s website, saving a copy of the cached file to your computer, or discarding the cached copy. Click the “Settings” button to manage display and cache settings. 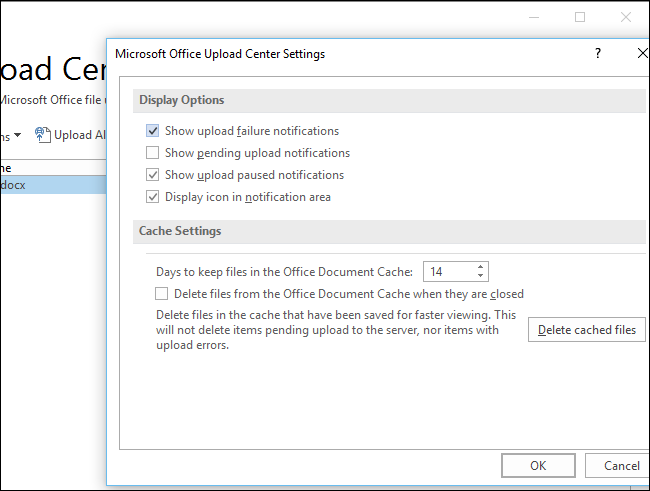 By default, Office Upload Center will display notifications when an upload fails or is paused, notifying you so you can take action from here. It won’t display notifications for normal pending uploads. Uncheck the “Display icon in notification area” option if you want to hide the Office Upload Center so you don’t have to think about it. The Office Upload Center keeps copies of cached files for fourteen days unless you select another time period. It also keeps copies of files that are successfully uploaded, allowing you to reopen them more quickly in the future. You can disable this or clear the cache from here. It’s easy to hide the Office Upload Center by unchecking that “Display icon in notification area” box. Alternatively, you can leave it in your notification area, but hide it in the popup system tray–just drag and drop the icon onto the up arrow to the left of your notification area. If you only save Office documents to your own computer’s local storage and never deal with remote services like OneDrive, you can hide it without any problems. Even if you save Office documents to other remote storage services–like Dropbox or Google Drive–the Office Upload Center isn’t involved. It’s only when you save an Office document to a remote server (or open one from a remote server) that the Office Upload Center is involved. It’s also an essential part of Office’s real-time collaboration features. However, you only need to open the Office Upload Center if it notifies you of a problem. There’s no reason the Office Upload Center icon should even appear in the notification area at all if everything is working properly. But it does. This doesn’t completely remove the Office Upload Center from your system, of course–it just hides it so you won’t be bothered unless there’s a problem. It’s safe to do this if the Upload Center icon there is bugging you. There’s no official way to completely disable the Office Upload Center beyond just uninstalling Microsoft Office, as this tool is a part of Microsoft Office. You could attempt to remove it from the file system and disable it in the Task Scheduler, but this could break things–and updates to Office will reinstall it, anyway. Go ahead and hide it, but there’s no real way to disable it. The Office Upload Center does have a clear function, but it also seems like needless complexity. With Windows 10 offering built-in OneDrive integration, why does Microsoft Office need its own, completely separate way of working with OneDrive? That’s a question for Microsoft, not us–but at least now you know what that icon does.